Act! 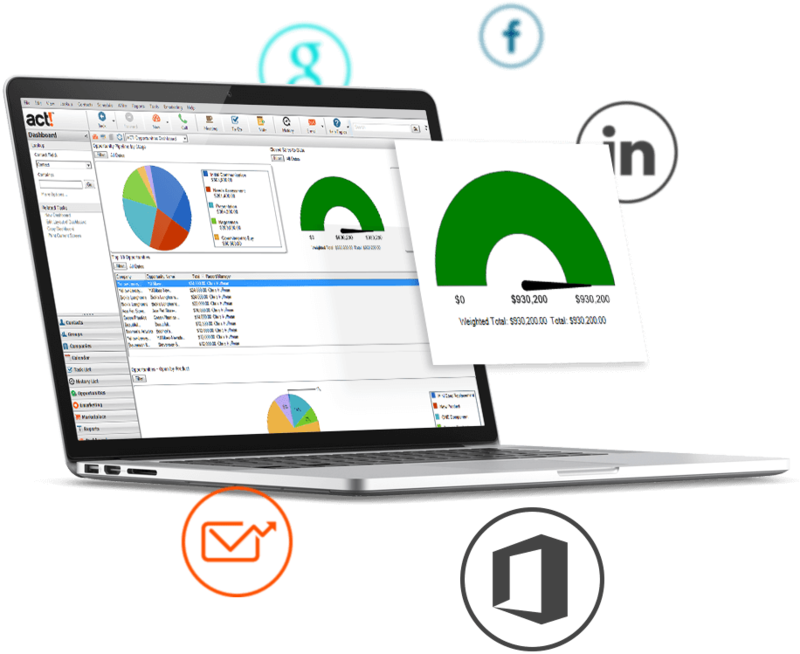 Pro is a CRM system designed for individuals and teams of up to 10 people. (If you require more than 10 users you will need Act! Premium). Learn more about the differences between Act! Pro and Act! Premium with our Comparison Chart. Act! will assist you in the management of everything related to your business contacts and calendar, organises all your prospect and customer details in one place and will market your products and services more effectively. Seamlessly interacts with the business and social tools relied on everyday such as Microsoft® Outlook®, Google® Mail, Google® Calendar, LinkedIn® and more. Act! 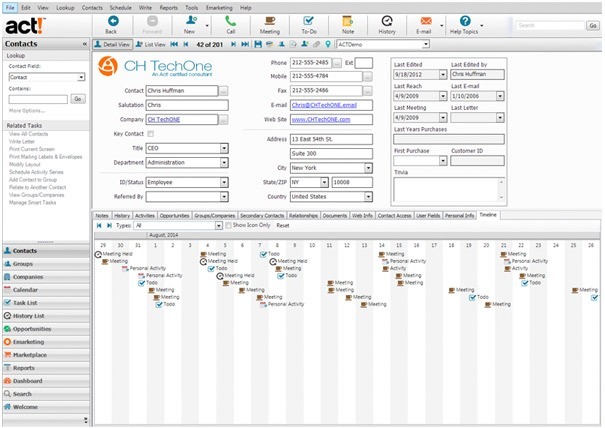 enables you to drill down into specific details about your business relationships, putting the latest information about your business at your fingertips from calendars and contacts to customer notes and history. View a complete history list and drill down by date, type of history, user or keyword to find the information you need. Export this information to Excel to make reporting even easier. Keep customer contact information, plus associated notes, history, documents, activities, opportunities, social media profiles and more in one organised place. Automatically link your existing and new contacts to company records, giving you an instant view of everyone you do business with at a single company. Mobility¹ - stay connected by accessing Key Contact, Opportunity and Calendar details from your mobile devices. Easily manage the tasks that need to get done every day, leaving you more time to focus on what counts - your customers and sales. Efficiently manage your calendar and track calls, meetings, and to-dos – all tied to your contacts for a complete view of what’s happening. Act! Scratchpad allows you to avoid duplication or loss of important information, a convenient virtual notepad. Smart Tasks will put activities in your calendar, send emails for you and much more, even when your Act! software is closed enabling you to accomplish more. Keeps you up-to-date with the successful or failed completion of scheduled tasks - giving you peace of mind that important database tasks are being completed. Act! works seamlessly with the tools your business already relies on, like: Microsoft® Outlook®, Gmail®, Google® Contacts, Google Calendar™, LinkedIn®, and Facebook®. Sync your Act! contacts and calendar with Outlook® and Google®, then easily access them from either application. Act! Integration with Sage50 Accounts –increase the functionality of Act! 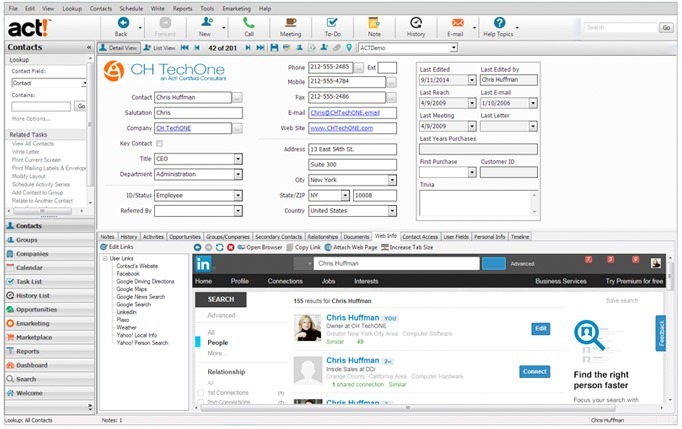 CRM with AlphaLink. View Company details, Products, Credit Control balances, Invoices, Sales Orders and general accounting activity from Act! without requiring access to Sage, users don’t even need to have Sage installed on their system! learn more about AlphaLink for Act!. 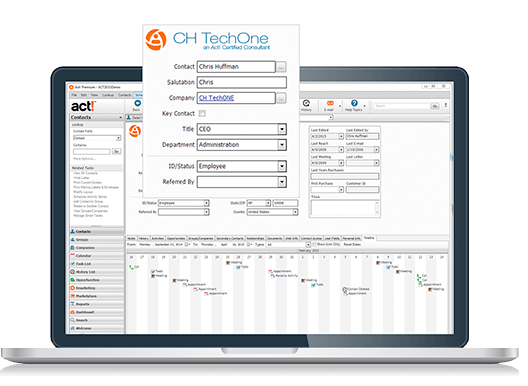 Write an Outlook® email from within Act! and a history will be recorded on the associated contact for quick and easy reference. View popular social media sites within Act! to see more detail about what your customers are up to now. Act! works seamlessly with the tools your business already relies on. Easily segment your prospects and customers, with just one click on any criteria, then design, send, and track professional, eye-catching email campaigns that reach the right customers with the right message. Get detailed reports - including opens, clicks, bounces, opt-outs, and more. Record history and notes back into your Act! database. Automate best practice processes to move opportunities through the sales cycle and free up valuable time. Track sales opportunity information including products and services, associated activities, and probability of close. Rank your hottest leads based on up to date customer interaction. Choose from 100's of customisable templates. Host & Share images and documents. Personalisation options like dynamic data integration for smarter targeting available.